I’ve been receiving several queries recently about how to read colourwork charts when shaping the crown of a hat, so I thought I’d write a quick post about it. A number of knitters seem to be making peerie flooers as their first colourwork project: so if this is you, and you find yourself bewildered by ‘chart C’ – worry not! I explain everything at the end of this post. 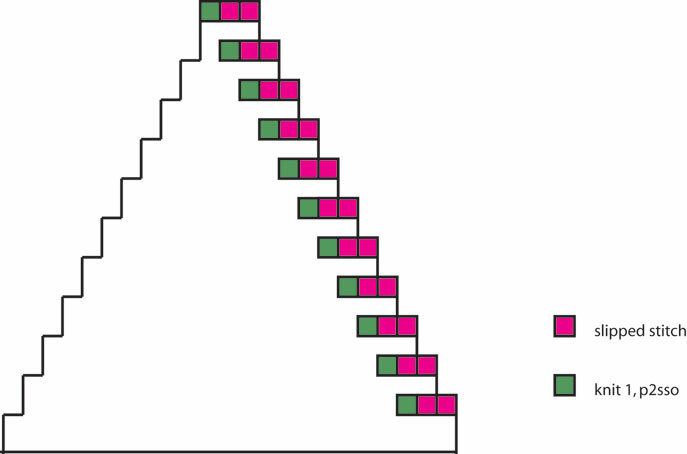 This chart represents one repeat, or ‘wedge’, of the hat crown. 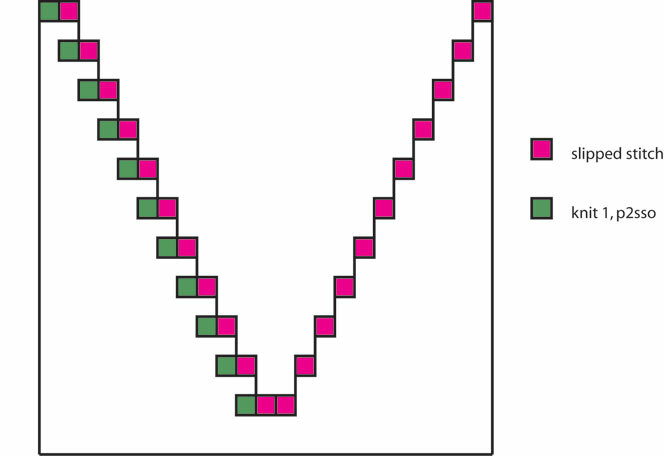 The knitter works across the chart from right to left, and when s/he encounters a pink square, works a right slanting decrease, knits the next stitch (from the column at the centre of the chart), and then works a left slanting decrease. The knitter continues on to the end of the repeat (left side of chart), and begins again. Each time a decrease is worked, a square disappears from the chart. 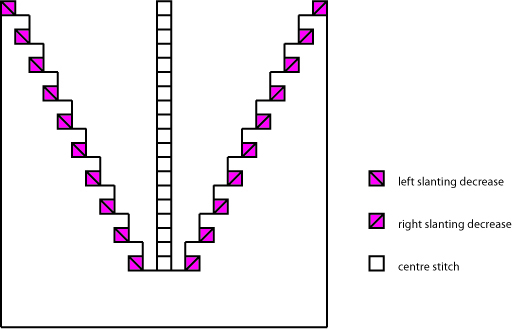 The pink squares reveal where two stitches turn into one, and the column of blank squares illustrates how the centre of the decreases lines up to create one spoke of the crown wheel. Effectively, five stitches are involved in making this decrease: two stitches are worked together on the right; two on the left, and one stitch is knitted from the centre column. slip 2 stitches together as if to knit; knit 1, pass 2 slipped stitches over. Here, the knitter begins the round at the centre of the chart, works across from right to left, and when s/he encounters a pair of pink squares, slips two stitches, knits the green square to the left, and passes the two slipped stitches over. This next crown chart is exactly the same as the previous one, except that the knitter begins at the right hand edge, and the slipped stitches are illustrated as pairs in the centre, rather than off to one side. I have used this particular method of charting centred double decreases on my Fugue and Caller Herrin’ hats. 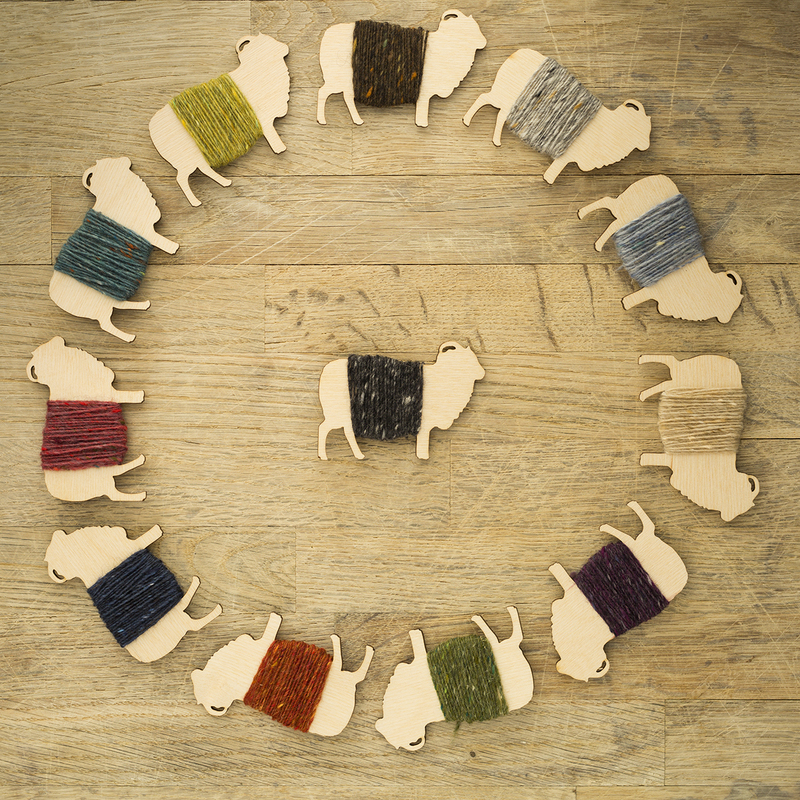 These are busy designs where the visual continuity of each round on the chart is important to the knitter. Because of this, the k1 part of each decrease is represented – as it is in reality – as the stitch directly to the left of the two slipped stitches. For other designs, however, it is useful for the knitter to be able to visualise each wedge and spoke of the wheel separately, and in such cases the k1 part of each centred double decrease is charted as a separate column of stitches. Here is the same crown chart again, but this time with the spoke – the k1 part of the decrease – represented in the column of stitches to the right. Here, the knitter begins the round at the centre of the chart, works across from right to left, and when s/he encounters a pink stitch (left side of the chart), slips it, together with the next pink stitch (right side of chart), knits one green stitch from the column, and then passes the two slipped stitches over. This way of charting has the distinct advantage of allowing the knitter to see, relatively easily, what each wedge and spoke of the crown will look like. 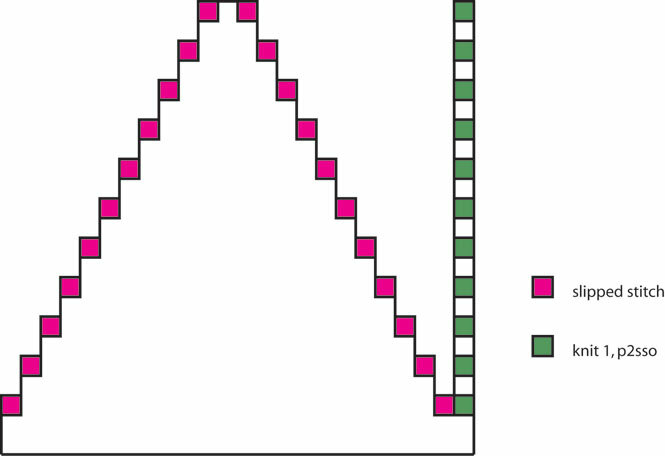 However, an element of confusion is introduced by the fact that the pink and green stitches at the right hand side of the chart are, in effect, worked out of turn. Also, some knitters might find something slightly anomalous in the way the decreases appear on this and the previous couple of charts, because the stitches that don’t exist anymore are actually still there (represented by the pink squares). * Additionally, representing the slipped/ decreased stitches with a different colour or symbol can sometimes make a chart quite difficult to read – particularly in a design where several colours are in use. My favourite method of charting a colourwork crown gets around all of these problems. Here the knitter begins in the centre of the chart (the stitch to the left of the yellow ‘start of round’ line) and works across from right to left. When they encounter the edges of the chart on a decrease round, they slip two stitches, k1 stitch from the right hand column, pass the two slipped stitches over, and continue around. 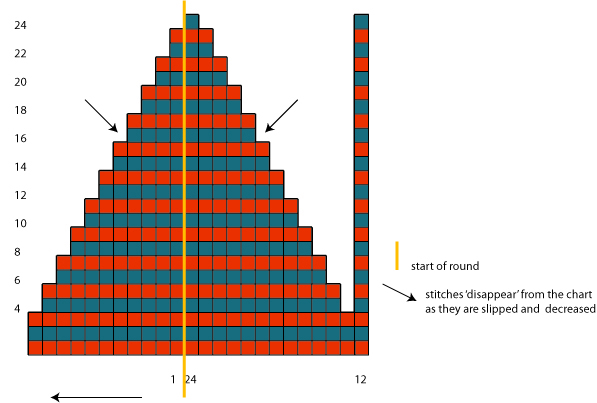 The stitches that are slipped and decreased simply disappear from the chart (as illustrated here by the arrows on round 16). This allows the wedge of the crown to appear as it actually looks, enables the knitter to see clearly what colour the k1 part of the decrease is worked in, and lends the whole chart greater visual clarity. Continue working, repeating the chart around, until round 4. On round 6, you decrease again, by *knitting 9 sts in pattern, slipping 2 stitches, knitting 1 stitch from the column, passing the 2 slipped stitches over, knitting 10 stitches in pattern* and repeating around. And so on – decreasing on every even round – until you reach the top of the chart, and return to the pattern instructions. Also, those generally interested in colourwork hats may be interested to know that you can now buy 3 of my patterns together as part of a collection I’ve called The Hats of Midlothian. (I was foolishly pleased with myself when I came up with this title, but when I, in a state of great excitement, told Tom, he remained completely nonplussed. Hey ho). *It would be all too easy to boggle one’s brain with the question of when a slipped stitch ceases to be a stitch. I’ll leave the ontological knitting to Heather. Please check your link The Hats of Midlothian. It doesn’t seem to be working . Hi! I am working on Susan Anderson-Freed’s “7-Pointed Star Tam”. The Tam Wheel Chart is similar to your last chart but doesn’t have the single vertical chart to the right of your triangle chart. It starts in the middle and goes left and decreases every third round. Do you know if I’m to slip the last stitch of the previous round, then the first stitch of decrease round? Or first 2 of decrease round? Any help would be greatly appreciated. having not seen the chart to which you are referring, your query is impossible to answer. You would be best served by approaching the person who designed the pattern you are knitting. Thank you for the detailed tutorial. I am captivated by Fair Isle just now, and especially by the wheels and rosettes at the crown of the bonnet, so this information is really useful and well-presented. Love the Peerie Flooers pattern…but that “tutorial” above for the Centered Double Decrease was far more complicated than it had to be, as pertains to Peerie Flooers. I think I was better off just reading your note in the pattern than coming here for added “clarity”…Nevertheless, it is a lovely pattern and I have enjoyed knitting it. Kate, I’ve circled back to your blog post and have a question on the Peerie Flooers decrease chart. When you say “When they encounter the edges of the chart on a decrease round, they slip two stitches, k1 stitch from the right hand column, pass the two slipped stitches over, and continue around” how do you define “edges” in this case? I thought it meant the “left edge” of the chart (ie. the last two stitches on the far left would be slipped on decrease row 4), therefore, you were referring to edge”s” in the plural as in every time you reach the left edge of the chart for all the decrease rows. However, when I read your directions, if I knit 10 stitches on row 4, starting from the first stitch to the left of the yellow line, there is only 1 stitch available to slip on the left edge, then, according to the directions, I must knit the next stitch which is on the right side in the column, thus, I don’t understand where the second slipped stitch is on the chart. The only thing I could think of was that (A) you might have meant to say, knit 9 stitches (not 10), slip 2 stitches (in this case, the last two stitches on the far left on row four), knit 1 (the first stitch from the “column on the right), then pass the two slipped stitches over, or (B) you meant that “edges” actually refers to both the left and right sides of the chart, thus, following your directions for row 4, I would knit 10 stitches, slip last stitch on far left, slip first stitch on far right, knit the next stitch, then slip the two slipped stitches over, 2 stitches decreased, then I knit the remaining 11 stitches until I reach the yellow bar. Then on Row 6, the next decrease round, slip last stitch on far left, stitch first stitch on far right from the column, knit first stitch to the left of the column, pass 2 slip stitches over, knit remaining 10 stitches that are left until I reach the yellow line again. Explanation “B” works when I follow your directions for the stitch count, but you mention that we need to K1 from the vertical column, not slip one from the vertical column on the far right. Any help with providing clarification would be very much appreciated! This is the dumbest question, but I’ll ask it anyway. On the odd rows of the Peerie crown, do you knit the stitch from the far right column and then proceed with the rest of the round? I’m sure I’m making this way harder than it should be! 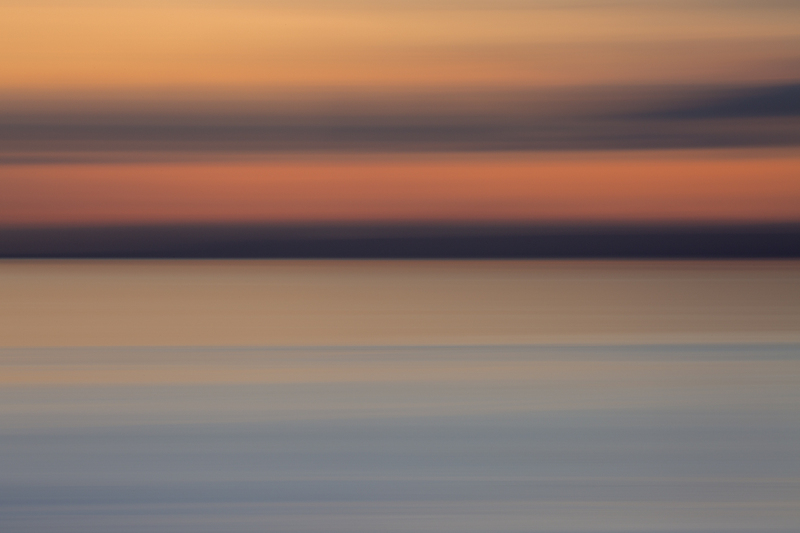 Love your patterns, your blog, your life. Thank you. no – you always start at the start of round line – which is represented here at the middle of the chart with the yellow line. You work the stitch column half way through the round. Seriously you are my new favorite knitting “god-dess”! Thank you sooooooooooooooo much! I have started a Tam about maybe gosh 7 years ago I think, maybe more, and I got stuck and gave up. This is the one bug a boo in colorwork knitting that I just could not grasp. I had my mind wrapped around this once before, took some notes, and left it to rest without following through with my project because I was too afraid to goof it all up! This is the best gosh darn tutorial I have EVER seen on decreasing in pattern with colorwork knitting. I seriously had no idea there were so many ways this could be charted! I’ve copied the whole thing and printed it out and will study it with my whole heart today and come back to buy one of your hat patterns! Big huge hugs! We are being tortured with a freaky New York winter moment with 80F weather here when its normally a nice 60F day for knitting! Just starting off on the sheep heid hat. I’m so glad that I read this very helpful tutorial first. I usually just dive in making mistakes and sorting them out as I go! I’m better informed now. Merci beaucoup. Je vais pouvoir finir mon bonnet grâce à vos explications. Thanks you very much. I will succeed to finish my peerie flowers hat. Your charts are very readable, Kate. I like the way you chart the crown of the tam. Thanks for this, I had got a bit stuck on this part. That’s brilliant, so helpful! I’m trying to design my own Fair Isle hat at the moment and have been struggling with the placing/charting of the decreases – think I’ll print this & study it! Thank you very much! I’m new(ish) to chart reading, and you just saved me tinking! Gosh, but you explain things clearly! I’m knitting peerie at the moment and I was very confused when I read chart c, but I decided to just continue knitting. As I followed the chart and reached the first decrease the lightbulb went off and it’s been smooth knitting ever since. I love the pattern and the hat is so beautiful! Thanks very much for this. I’m really enjoying knitting Peerie Flooers, and it’s good to have this for a possible sticky bit (due to my inexperience). Great information, and that is quite amazing if that was a quick post for you! And what a lesson it is ! I will use this one day, no doubt. As for myself, I’m three years late… tackling “Owls”. Thank you for spending so much time and talent for your knitters. 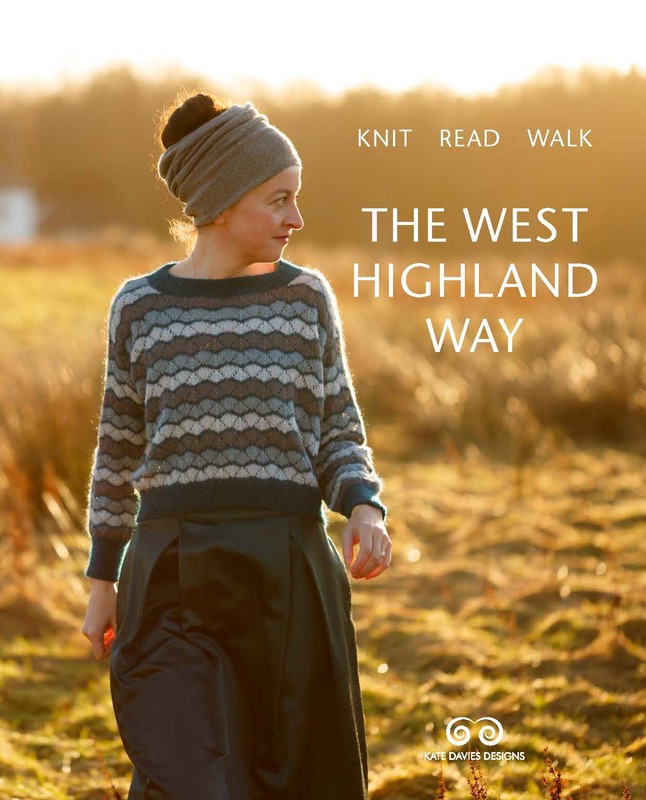 A wonderful tutorial, and a very generous gesture for your knitters. He should at least have got the pun from the football association. Aren’t Hearts your local team? I think it’s a brilliant name. Thank you so much Kate! Very clear and very useful. Oh Dear Me. I had thought to try Peerie Floores as my first attempt and maybe I shouldn’t? I am used to knitting socks and I always choose straight knit or pearl patterns. I haven’t done cables or any difficult stitches but thought with assist from my yarn store I might do something different. I’ll have to think about this. I love all your designs. And as a nurse I am amazed at the detail of your blogs about having the stroke and recovering from it too. Those should be put into a book I think and used as a teaching tool for people who suffer the same affliction. You are inspiring. I am also aware of the huge effort it takes to recover that won’t translate to the page. Very informative, and what wonderful graphics you created. Hi Kate – I too prefer the last method of charting. You have done an awesome explanation of all the different methods. I can’t imagine how long this post took to write. Congrats to you. Thanks so much for this Kate! It will be a ” go-to” post I’m sure for me.